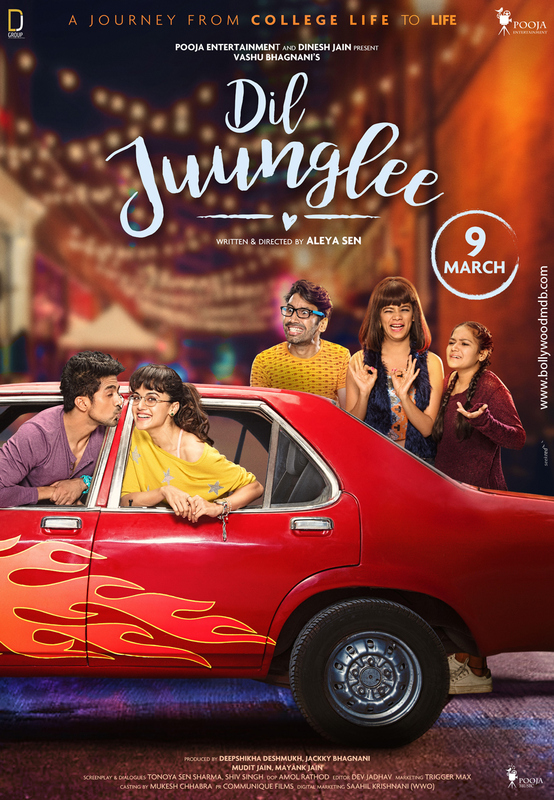 Dil Juunglee Review: Dil Juunglee is a weak flick which could have been much better. Dil Juunglee is a wannabe love story which could not manage to bring audiences to the theatre. Sumit aka Sonu (Saqib Saleem), an aspiring Bollywood actor meets Koroli aka Koro (Taapsee Pannu), an introvert and shy girl in an English speaking class. Koro plays an English literature teacher and helps Sumit to teach him basic English so that he can at least enter the film industry. As the plot moves further, Koro falls for Sumit but he does not. Though they were a couple till the first half, things take a drastic change after the interval. Dil Juunglee takes a seven years leap and what happens next forms the crux of the story. Over the top unbearable acting by the entire cast. Taapsee's talent is wasted in the film. So do Saqib's and other cast members. The two lead have delivered commendable performances in the past but this was by far their worst. The supporting cast was ok, but were not at all praiseworthy. Aleya Sen debuted with Dil Juunglee but fails miserably to deliver even an average film. She hardly managed to hold her actors and plot of the film. The slow pace and the cliche story with unbearable dialogues is what we have witnessed from the last 5 decades. She has nothing new to give. Dil Juunglee is one of the most technically unsound film. It has poor cinematography and the weak screenplay, the makers have put in their least R&D in this film. The locations were good but added nothing in building the film. Even the background score was least pleasing. The first song of the film being Nachle Na, is a party song. There are other songs like the remake of the veteran song Gazab ka hai din, Dil jaane na and Beat Juunglee. Despite having good songs in the film, it couldn't make an impact. Even if you are a big Taapsee and Saqib's fan, this movie doesn't deserve your hard-earned money. The trailer of Race 3 might be attached with Avengers: Infinity War! Abhishek explains his Sikh connection by sharing a beautiful picture of 3 generation of Bachchans! Say hello to Suraj aka Saqib Saleem, The Angry Man and the fifth member of Race 3 family!